I thought being a therapist would be easy. When I was first studying theories of psychotherapy, before I started working with people, I was actually worried that, eventually, I’d get too good at therapy and become bored. I imagined that I’d eventually know all there is to know about the mind, possessing the skill-set to very quickly “fix” anyone. That was a fantasy; comforting, though misleading. I can’t say I’m fully over it, though, in this moment, it feels like I’m looking back on it—with chagrin. He was probably more perceptive of me than I was of him. I had idealized theory and technique. It had not yet occurred to me that those things are useless if they’re not used in the service of building a close relationship. 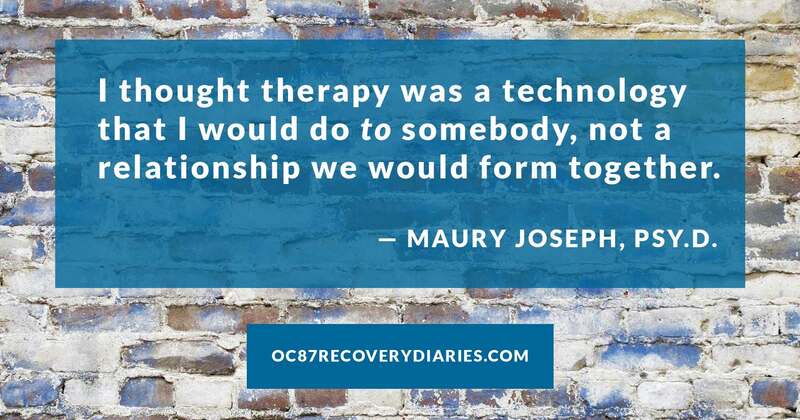 I thought therapy was a technology that I would do to somebody, not a relationship we would form together. That latter notion, of therapy-as-healing-relationship, was also in the books I was reading but, for some reason, I devalued or selectively avoided that way of thinking. Why? Why did I avoid the concept of therapy as a healing relationship? Simply put, for my own neurotic reasons, I just preferred a notion of therapy that would shield me from the challenges that come with vulnerable participation in a real, intimate relationship. I was just not ready to entertain the possibility that it would be my emotional engagement, not my knowledge, which would make me a therapist. 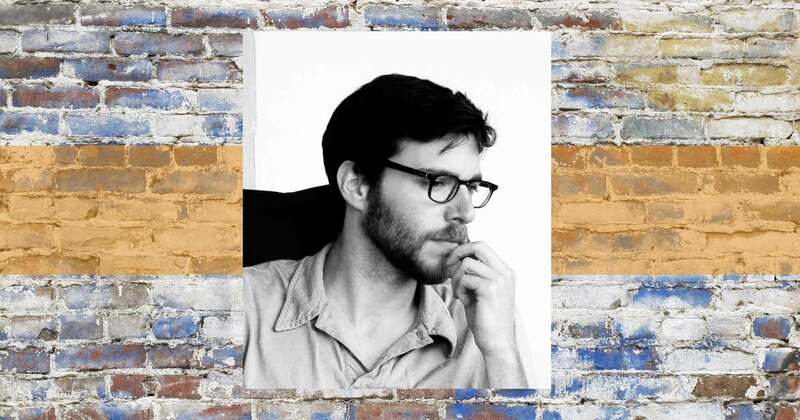 The therapist’s emotional vulnerability and involvement is probably not the first thing on the mind of a person who is new to the therapeutic process. I think most people coming to therapy prefer the notion of a therapist as a sound, solid port where they can drop anchor to escape their personal storm of madness, although that, of course, varies. No wonder we tend not to think that the therapist has some madness of their own. As described above, I too have enjoyed that idealized image of myself in which I master all of psychology and become an emotionally inert fixing machine. It’s good to know I’m not alone in that fantasy. Trends within my professional community even promote this. Within the psychotherapy world the therapists’ emotional difficulties are discussed far less than other topics. In our literature, we’ve grown more comfortable acknowledging the fact that the therapist has feelings, but it’s still relatively uncommon to find articles in which therapists acknowledge their own neurotic reactions in their relationships to their clients. This is further evidence that both people seeking therapy and therapists have some discomfort with acknowledging that a) the therapist’s feelings are involved in therapy, and b) that chances are good that whatever neurotic stuff the therapist does with their feelings in their outside relationships will get triggered in their therapy relationships. I, too, did not want to know this. 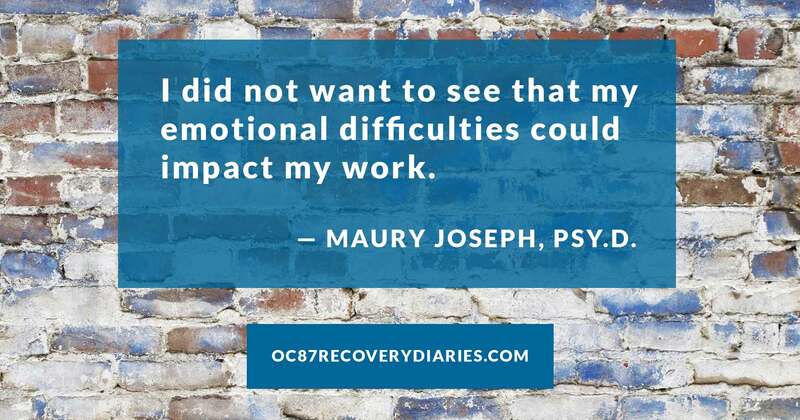 I did not want to see that my emotional difficulties could impact my work. I, too, wanted to believe that, in my therapy relationships, I was the emotionally sound one; the one who knew what it all meant and what to do about it. I wanted that. Fortunately, my patients didn’t let me get away with believing in that fantasy version of myself. When I hid behind my fantasy image of myself and avoided being vulnerable with them, they found ways to let me know that that did not help. When I backed down from facing my emotional challenges as they came up in the therapy, my patients did not have the support they needed, so they could not face theirs. Their continued suffering was the clearest possible feedback that something was going wrong in my work, and, at some point I started to listen and learn. Alicia had sought many gurus, and, starting with her father, had experienced many relationships where she was encouraged to abandon her own ideas and accept the ideas of a (usually self-proclaimed) wise man. When I met her, she had become addicted to other people’s ideas, although other people’s ideas never seemed to help her reach her goal of understanding herself and overcoming her symptoms. Problematically, Alicia’s addiction to a guru figure was complementary to my addiction to medicating my anxiety about the unknown with a false sense of omnipotence. When she would ask, I freely shared my “brilliant” ideas and theories of what was going on with her and what might help her. I used the interventions I thought would work, but didn’t notice when they did not. I justified this to myself in many ways, until the reality that she was not getting better began to nag at me. She was still depressed, still aimless. Finally, my unease about this encouraged me to listen more carefully, to see what she might be trying to tell me about why my therapeutic efforts were not helping. I began to notice a number of things. I noted her tendency to ask me direct questions, e.g., for my opinion or “theory” about her. I found that when I would answer directly, she would often go on to tell stories of failed gurus from her past, which I began to read as an unconscious supervisory comparison (e.g., “Maury, you’re doing the thing that has failed in the past,”). I noticed that, when I could suspend my need to “be the expert” and wait for a few seconds before answering her direct questions, she would repeatedly sigh (a sign of tolerable anxiety associated with self-reflective thinking) and then begin to answer her own questions, or discover the barriers that prevented her from answering her own questions. I noticed that she was clearly able to do much of the work for herself; she did not need me to be her guru, but instead needed me to get out of the way so she could recognize the guru-nature that she had always had inside her, a self-knowledge that she had learned to relocate into others. Alicia seemed to experience a sense of self-efficacy and relief as she became less dependent on me and more able to rely on her own inner wisdom. In my own therapy and supervision, I reflected often on the lessons I was learning from Alicia. I began to realize that my needs to feel like an omnipotent guru (Spoiler Alert: I’m not.) had roots in my history, and that this tendency had come up as a problem in other relationships in my life. I had received the feedback that I was a “know-it-all” and even “arrogant” for a long time, but seeing how my neurotic need to feel “wise” was holding Alicia back from finding her own inner wisdom finally helped me begin to see the costs of acting out this part of my personality and helped me start to change. At that point, every one of Alicia’s therapy sessions was also a therapy session for me. She would try to pull me to be a guru, and I would have to force myself to push against my own impulse to be that for her. I had to accept just how clueless I was, and learn to tolerate the pain of my cluelessness, so that she could discover how smart and capable she could be. As I became more able to rely on Alicia’s expertise about Alicia, and as I learned to bear the anxiety and other feelings that came with being the least-knowledgeable one in the room, we both became less dependent on my “expert” façade. With great hesitation, we both began to accept and experience our own strengths and limitations, and became more human and vulnerable together. I would not be here without these hundreds of big moments and all the micro-moments that occur barely-within-awareness on the road to new ways of being and relating. My patients, therapists, and supervisors, my wife, my family, my friends, and even my cat have all been incredible mirrors and teachers, showing me my emotional blind spots and the damage I can do when I am more interested in protecting my ego than facing our truth in this moment. I don’t always like the learning. Sometimes I put it off for a long time. Though I think I’m pretty self-reflective about my whole “neurotic need to feel omnipotent so I never feel anxious and vulnerable” thing now, it still shows up; maybe not in the grand and glaring ways it used to, and maybe not as often. It is clear to me, though, that at a certain intensity of anxiety I will forsake the vulnerability and truth of this moment and take refuge in a grandiose vision of myself. In my better moments, and with the help of the many mirrors around me, I can catch myself and course-correct, but I have to acknowledge that that’s still a part of me and will likely always be. And I hope you don’t think an omnipotent façade is the only false refuge I have had to face. Like most of us, I have many different styles of avoiding reality in my repertoire. I contain multitudes. Facing, even for a second, these human truths—that I’ll never fully understand another person’s mind; that some degree of cluelessness and helplessness will always be a part of my day job; that no matter how much theory and technique I know I can’t “fix” anyone; that I will never fully master my anxieties and will always be vulnerable to going back to my most destructive crutches, no matter how much I grow—is painful. What I have learned, though, is that to be even half decent at what I do, I am called upon to experience and learn from that pain so that I can be a part of a healing relationship, rather than seek false refuges from one. *Alicia’s name and some circumstances have been altered. Maury Joseph, PsyD (mauryjoseph.com) is a psychologist in Washington, DC, specializing in treatment-resistant depression and anxiety, and medically unexplained physical symptoms. 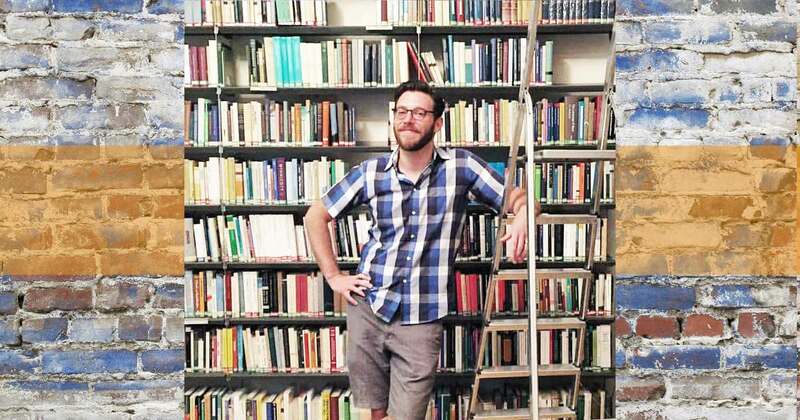 He is co-founder of the Institute for Emotions and Health in DC, a practice focused on diagnosis, treatment, and research of medically unexplained physical symptoms. 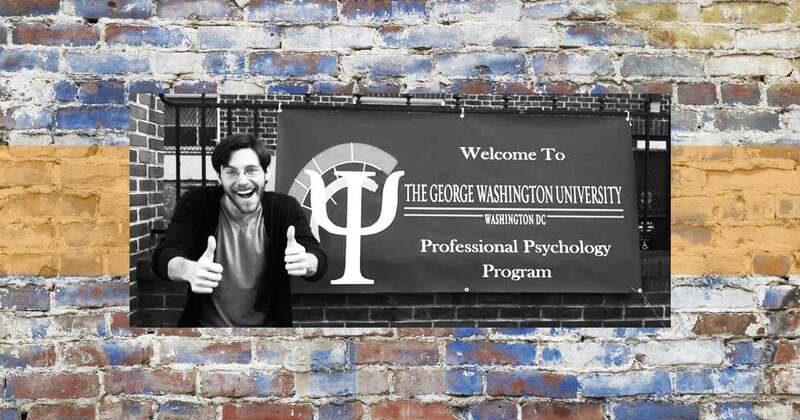 He is chair of the ISTDP training program at the Washington School of Psychiatry, and serves as an assistant clinical faculty member at George Washington University and adjunct faculty at The Chicago School of Professional Psychology. To see more of Dr. Joseph’s writing, check out mauryjoseph.com. Adesola Ogunleye, a Nigerian American immigrant who lives with depression and anxiety, is interviewed on this episode of OC87 Recovery Diaries on the Radio.